Take a stroll through any clothing section-women's, kid's, even men's, and you'll see that almost all the clothes have some embellishment. It may be buttons, zippers, or jean studs, all of which are pretty standard. But it those clothes that are embellished with sequins, beading, faux gemstones, metal accents, and ribbons that need extra special care. The fewer times your garment is cleaned by washing or dry cleaning, the longer the accents will last. Every trip to the cleaners or every ride through the clothes washer damages the accents by causing them to become dull or loosen from the fabric. If the embellished garment has a stain but is otherwise clean, try spot-cleaning the stain first. If the stain is a non-oily food stain or dirt, mix a solution of one teaspoon liquid dishwashing detergent with one cup of cool water. Mix well and then use a cotton swab dipped in the solution to remove the stain. 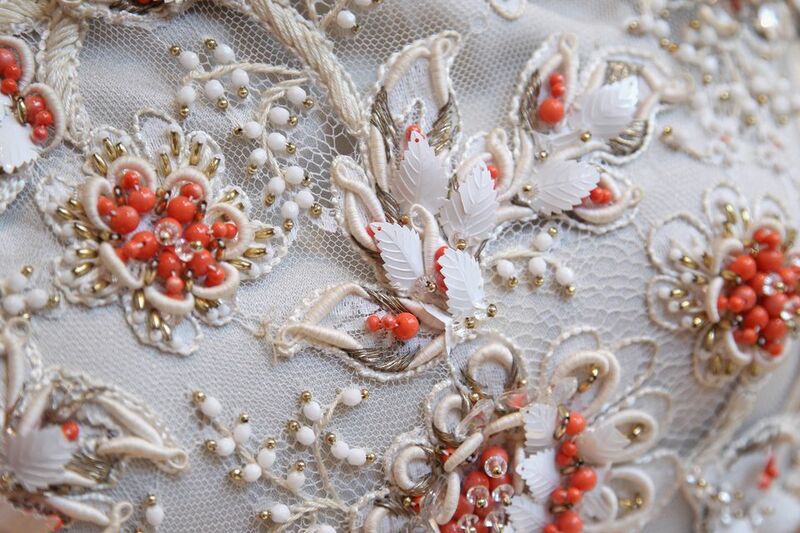 Work between the embellishments to reach the fabric as well as the stain on the surface of the embellishments. Keep blotting with a clean white cloth or paper towel as the stain is transferred. If the stain is oil-based, you may need to use a dry cleaning solvent. Use the same cleaning method using a cotton swab. For ink marks, follow these stain removal tips. For overall cleaning, always follow the garment's care label. Many will state to dry clean only. However, if the base fabric is washable, you can usually wash it at home. If you decide to launder the beaded or sequined garment at home, hand washing is always the best choice over machine washing. If you are going to machine wash, use the gentle cycle and put the garment in a mesh laundry bag before putting it in the machine. Be prepared to check for embellishments that may have fallen off during washing which can damage your washer. Always allow the embellished garment to air dry. Never place it in a hot dryer, which can damage the finish or melt decorations and loosen the glue. If the garment is woven, hang to air dry away from direct sunlight and heat. If the garment is knit, then dry flat to prevent stretching. If the garment requires ironing, then always press on the wrong side of the fabric and use a pressing cloth between the iron and the fabric. Use the lowest iron temperature possible. Instead of ironing, consider using a clothes steamer to remove the wrinkles. Before you launder anything with metal accents, test the metal in an inconspicuous spot to see if the metal will tarnish. Highly acidic water, vinegar, chlorine bleach, and high concentrations of oxygen bleach can dull the metal finish. Tarnish is not only unsightly; it can bleed onto the fabric and become difficult to remove. If you decide to launder the metal-embellished garments at home, follow the guidelines on the care label and hand wash or use the gentle cycle on your washer and a mesh washing bag like one from Diamond Laundry. It is best to air dry clothes with metal decorations to prevent any adhesive from melting in the high heat of the dryer. Heavy metal studs on clothing can also damage the finish of your dryer drum and lead to rust formation. Follow the same ironing guidelines as recommended for beaded garments. For best results, remove ribbons from the garment before washing. The ribbons may not be colorfast, and you'll end up with dye bleeding. If the ribbons are permanently attached, use cold water to wash the garment to prevent fading and bleeding of colors. And, to help attached ribbons last longer, brush the ends with clear nail polish so they won't fray. If you have a garment that has a few beads or sequins and it is labeled dry clean only, you can use a home dry cleaning kit. Treat any stains with the kit's stain remover and use a low dryer heat setting. This will freshen the garment and help remove any wrinkles. For heavily embellished clothes like a sequined jacket, head to a professional cleaner. The safest cleaning method is to ask a reputable dry cleaner to "foil" the accents so they won't crack or tarnish. Or, ask that the garment be hand-cleaned. Some cleaners will remove the embellishments before cleaning and then reattach them. This is quite expensive so determine first the value of the garment and your attachment to it.